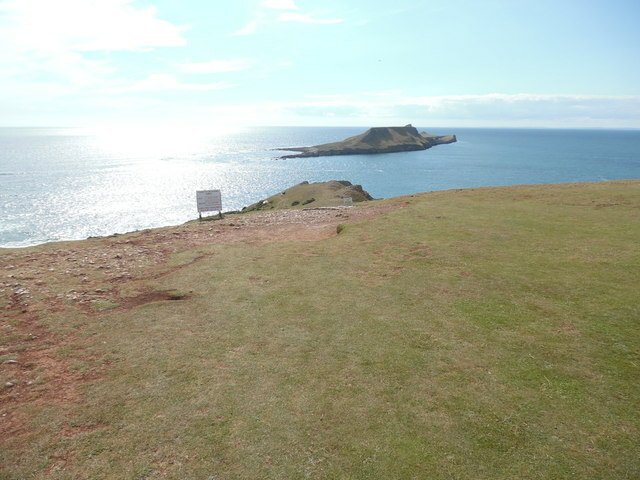 This photo shows Worms Head from the mainland, the word "worm" deriving from an Old English word meaning "dragon" or "serpent". The notice on the left refers to today's crossing times and states that it is too late to cross due to the high tide around Worms Head. In the 2½ hours either side of low tide, one can walk from the mainland to Inner Head, which is the eastern part of the island. This island was bought by The National Trust in 1967 using Enterprise Neptune funds.